Many questions arise about smoking in the workplace. Do employers have a legal right to prohibit their employees from smoking while at work? When and where does the law allow employees to smoke? The law does regulate smoking in the workplace to a degree, although smoking laws in the workplace are governed by state, not federal law. This article’s focus is specifically on Arizona law. Although the Smoke-Free Arizona Act has given great power to employers to completely eliminate smoking on company property, employers have several responsibilities under the act. Employers must post “No Smoking” signs! The signs must be “clearly and conspicuously posted” (see A.R.S. § 36-601.01 (E)(1-2)). For employers this takes little effort. Employers can simply order No Smoking signs free from the Arizona Department of Health Services website. This makes it convenient and easy for employers to comply with this law. Note that the law states that the “No Smoking” signs must be clear in of themselves and must be posted “conspicuously” at every entrance. Conspicuous is an important condition of this law as the sign should not be hidden or otherwise obstructed by anything that would make it difficult for others to see. Employers also have a duty to remove all ashtrays and smoking receptacles inside the business to at least 20 feet away from business entrances (see A.R.S. § 36-601.01 (E)(3)). Employers should additionally ensure that employees, customers, etc. are not smoking within 20 feet from entrances. This is known as the 20 Foot Rule. Employers have a duty to communicate to current employees and potential employees about the act. This could mean reminding employees in a company meeting about the smoking laws. This could mean describing this as a condition of their employment with the company in a job interview with the future employee. This could mean putting a section in an employee handbook saying that the workplace is smoke-free and if smoking is desired employees need to do so outside, at least 20 feet from business entrances. There are many ways that employers can inform their employees, but employers should not shirk this duty. 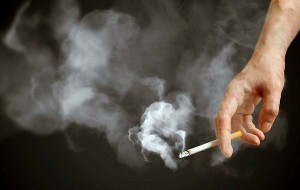 Employers have a duty to enforce the no-smoking policy. Although it is the county health department’s role to enforce the act, employers still have a duty to ensure that the act is not violated in their place of employment. This puts their own employees at risk for second-hand smoke (see Section 1.1 and 1.3.2 of the Smoke-Free Arizona Act 2016 Annual Report). If you are an employer that has questions about how to ensure compliance with this law, then it is important to get competent legal advice. Employers can also reach out to some of the free resources available such as the Smoke-Free Arizona hotline (1-877-4-AZ-NOSMOKE). Employees that feel they are being subject to unsafe conditions due to an Employer non-compliance with the law can fill out an online complaint form (www.smokefreearizona.org), or send an email ([email protected]). The Smoke-Free Arizona Act has been very successful in eliminating smoking from most public places and in places of employment. In The Smoke-Free Arizona Act 2016 Annual Report it was reported that in 2016 Arizona “earned an “A” grade on the American Lung Association State of Tobacco Control Report for maintaining a strong and comprehensive enforcement program of the Smoke-Free Arizona Act.” If you feel that your employer has violated the Smoke-Free Arizona Act you may file a report, or speak with a competent Mesa employment law attorney. Nobody should have to work where the negative health effects of smoking are present. Call today!